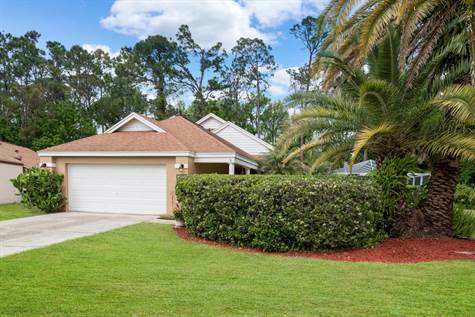 $274,900 Large Pool Home with Nice Updates! "Central Location at End of Cul-de-sac!!!" Bedrooms: 3 "2 Downstairs/1 Upstairs"
Bathrooms: 3 "2 Downstairs/1 Upstairs"
One of the best lots in Indigo Lakes! Immaculate 3/3 pool home on private pie-shaped lot at end of cul-de-sac. Home features upgraded bathrooms & 2 Master suites with walk-in closets; and 3rd bedroom featuring custom built-ins & queen-sized Murphy bed. Exceptionally well-maintained with recent exterior paint, AC, garage door opener, & pool pump, including new kitchen appliances & screen, this home is literally move-in ready. Beautiful park-like yard features mature landscaping around pool & backs up to a conservation area for totally private relaxation. This home is perfect for entertaining, barbecues, or a lazy day just lounging in the pool for total relaxation. All this & located in the midst of Everything Daytona Beach has to offer, like: the International Speedway & One Daytona; institutions of higher learning; restaurants; shopping; major roads; hospitals; museums; the Hard Rock Cafe Hotel; and, of course, the ''World's Most Famous Beach!'' And just an hour to Orlando Theme Parks! Roof 2009, Garage Door Opener/Mechanical 2012, Exterior Paint 2015, Pool Screening 2017. All information is deemed correct but not warranted & measurements are all approximate. Home is selling as is with inspections gladly welcomed and security system does not convey.